In short, Antalya is a great old city whose city centre is beautiful. History all around you, the Turkish people are friendly, the food is great and the beach like you’re in heaven. A Boom town in Turkey with today more than 1,5 Mio. Inhabitants. The old part of the town is called Kaleiçi and is really beautiful. Antalya is one of the best cities of Turkey. It have regions and hotels for every special holiday styles. The jewel of Turkey's Turquoise Coast, with a beautifully-preserved old city boasting Ottoman architecture and Roman ruins. Gaze out across the sea and you can almost imagine being able to see Alexandria on a clear day (though clearly you can't). The old city and harbour are an absolute delight, with the surrounding new city brash, modern and busy. Antalya is a beautiful old city on the southwestern coast of Turkey along the Mediterranean whose city center features ancient wonder such as Hadrian's Gate, Korkut Mosque, Tekeli Mehmet Paşa Mosque, and the famous fluted minarets (Yivli Minare). I love Antalya because it is the classic beach town in which its easy to escape the "all inclusive resorts" and other noisy tourists - with the added plus of incredible historic landmarks. Unlike Istanbul's toursity area's there aren't constantly people handing you fliers, asking you into their restaurant, or trying to sell you something. I stayed for the most part within the walls of the old city, which was nice and quiet in November with few tourists, but still warm enough to go swimming! Antalya is also close to other ancient cities such as Perge and Olympos that you can take day trips to. Although there is a lot to do and see around Antalya you can see the important stuff in a long weekend. 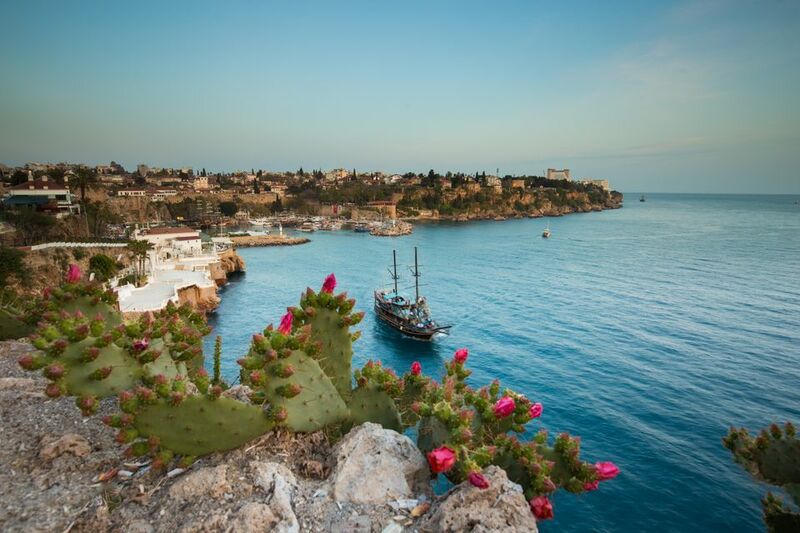 Also known as Old Antalya, the small historic section called Kaleiçi at the center of the sprawling modern city surrounded and protected the old Roman harbor, which was Antalya's reason for being. Today Kaleiçi is a protected district, with preservation of historic buildings required, and strict regulations on any new building.